Unshakable faith in God and tolerance is the medicine of Grace to wipe out our sorrows. Bhakti(faith) alone can give us the capacity to put up with sorrows. Temples are the agencies for developing that Bhakti. Hence, the need for temples at all places. All offerings to the deities in the temples are tokens of our gratitude to God. That which is within all, which is seen as "This" is the source. He who is within and sees as "This" is God. God is the reality. God is in yourself. What is limited is Sadhana(devotion); what is unlimited is the end. 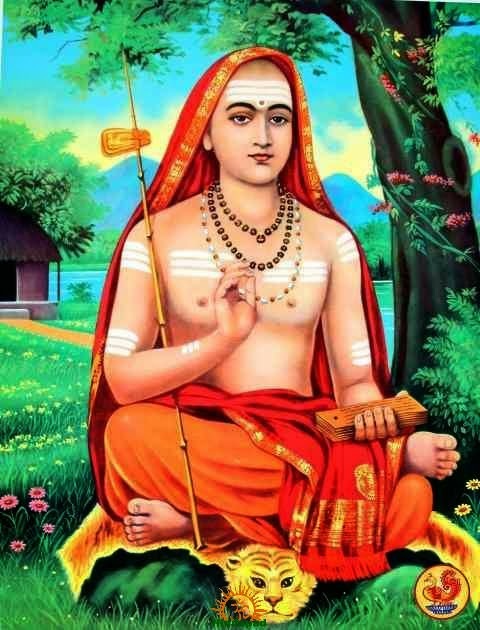 He alone is an Acharya(teacher), who, after clearly understanding the conclusive teachings of the Sastras(scriptures of knowledge and wisdom), makes the people of the world gain their welfare by making them stick to the righteous path shown in the Sastras and also himself does everything according to Sastras and always remains in that state. Many acts relating to God, like building temples, digging tanks are performed. While executing them, there would be many difficulties. There would also occur several kinds of dishonour. But the seekers, without bothering about any of these, complete their tasks single-mindedly by removing impurities from their minds and not letting their minds wander. Thus having focussed their mind, they acquire control of mind and in the end, they realise the Reality that is to be known. Digging tanks, building temples and such other acts are called poorttam. The performance of sacrifices, etc., is known as ishtam. Combining these two, we have the word Ishtapoortam. In all that you do, let love be the sole motive. Any need must be with reference to others and not self. Let your action be out of love for others. Passions such as desire and hatred , anger and malice must be totally eschewed. If love becomes the grounding principle of all deeds, then most of the ills of the world would vanish. We know the faults that we commit, even if others do not know about them. Sometimes we realise that we are doing so many evil things and repent bitterly and feel why we were born. Our duty is to pray to God -"I have committed so many faults. Will you not, 0 merciful God, give me the will power to not do such mistakes in the future and, will you not purify my mind?" We must note down in a diary every night before we go to bed the faults committed by us and pray to God to give us courage and intelligence not to do so. This must be propagated widely. Parameswara(the supreme lord) and Sriman Narayana(the almighty) are one and the same in reality. They are not two separate. This is the conclusive view of all the sastras. Names differ, forms are different, occupations vary, but the reality which is within Them is one and the same. What is the purpose of human birth? To earn, to eat, to undergo misery everyday and finally to die? Instead of earning and suffering, can we not die now? The purpose of birth is to avoid re-birth. Except man, all animals grow horizontally. Only man grows vertically, instead of growing horizontally, it is God's will that he should grow vertically in order to look up. God has given to animals devices for their self-protection; It is to man alone that He has given intelligence. By doing nothing evil, we attain freedom from the cycle of re-birth; By giving up attachment, we avoid sins. What is the use of education? Its first use is to develop humility (vinaya). In olden days, the disciple who went to a guru was called "vineyan"(a seeker) meaning a person of humility which is the hall-mark of Instruction he had from his guru, the fruit of education. Education without humility is no education. Education is the same today as it was before, but methods have changed. The medicine is the same but if the diet is changed, the medicine becomes poison. Education has today become merely the means of livelihood. For true education, the student should go to a Guru and follow the Gurukula system. If we engage an inquiry into the Atman(soul), at the end of it, it will be clear that God is in us as our very self. When that stage is reached, we have no use for the Devas(gods/idols). Then all karmas(actions/wants) will fall away from us. But, until then, we must obligatorily do the karmas directing them to the gods. Those who are the leaders of a group, society, or state should not neglect the established religious customs and usages. For themselves they may not be in need of Church/Temple ceremonies, for instance, their advancement in spirituality may not require them. But if they begin to neglect these rituals, the people for whom the rituals are really helpful, will also start neglecting them. This would be setting a bad example for the people. In the words of the Bhagavad Gita, the wise one should not unsettle the minds of those who are ignorant, and are attached to action: on the contrary, the wise should encourage them to perform what they should perform, by himself performing the appropriate actions well and with diligence. It is a duty cast upon the leaders and those, that are at the top, to lead the people from where they are, and not to refrain from participation in the traditional ways of worship. By multiplying wants, we only increase poverty. What ever is essential for life and due honour/respect should be made available to all the people in the society. It is for doing this that we must plan the activities and interactions. Men of means should live simple, like the poor, and should not increase their wants beyond necessities. The rich should share their prosperity with the poor. This is Punya(a noble deed), leading to salvation. The more we increase our wants, to that extent, there will be no peace or comfort and it will only produce poverty and sorrow. Vedanta which is the peak of the Vedas teaches the way for the removal of sorrow. Hatred and desire arise only in respect of the objects other than ourselves. Such desire will not arise if those objects are rendered identical with us, if there is nothing other than us, then desire will not arise. If there is no desire, there will be no wrong effort and thus no sin. When there is no sin, there will be no suffering and there will be no misery in the world. We may face many types of sorrow. What seems to be sorrow to all the people of a place may not seem sorrowful to us. If we stay always happy, free of want for anything; we remain untouched by sorrow like the lotus-leaf and the Kalakodi - seed; that state is called yoga. "Know that to be indicated as yoga, the state which is separation from being united with sorrow, The removal of association with sorrow is yoga." In order to reach one purport, why should the Vedas speak of so many matters? This question may arise in our minds. It is through many matters that it is possible to understand that one purport which is true Reality. The matters - yoga, meditation, austerity, sacrifice, performance of karma; when these are accomplished, what they indicate is that one Reality. It is that Reality which is the true purport of the Veda. All other things are of a transient nature. They become woven into a story and then even that story disappears. What remains is that Reality. What for is the science of medicine? It is for keeping the body strong and healthy. What if the body is not strong and healthy? The body will be subject to diseases. What if there is disease? One will not be able to function properly. He who has given this body is the supreme Self. This is the truth, we should practice several disciplines. We can practice them only if the body is well. In order to keep it well, we must prevent it from becoming a prey to disease. The science of medicine tells us how to prevent diseases. Thus, Ayurveda helps in the realisation of Advaita(Non-duality) experience. Nirvikalpa Samadhi: This is the goal of yoga. In this, the mind ceases to function and vanishes once and for all, leaving the self to shine forth alone. In Advaita too, a seeker takes the path of meditation; but here the object of meditation is the distinction-less Brahman(the creator). Our religion Hinduism has grown by devotion, meditation and self - purification. The other religions might have grown by propaganda and conflict. The reason for crores of our people remaining within the fold of Hinduism, in spite of powerful propaganda of other religionists, wars, lure of money, etc., is that we see a Mahatma (Noble man / Great Soul / A reflection of God) in our midst by whom we are constantly inspired. We develop devotion to him and generate faith in our religion. There is a text in the Veda which says that a flowering tree attracts bees automatically. If we examine amongst ourselves and find the one that could be identified as perfect, the whole world will follow him. A child eats earth. The mother notices and ties the child's hands. The child gets angry and cries. Is it without reason that the mother ties the child's hands ? In the same line, we do not know the mercy of Universal Mother. The good or harm coming to us has its source in Her Grace; Suffering - is a form of Her Grace for some reason. We must accept whatever comes to us, good or bad, as Her Grace. We do not know why she gives it. Our vision is limited. We do not know what precedes it or follows it. If we are able to look into the past present and future, we will know that God does no harm to us. Other than God, there is no kith or kin for us. We could not say that a child or an idiot who keeps quiet without activity like a stone is great. We may not presume that he has attained Jivan-mukti(liberation). This state is the result of sin. Only, that person may be realized as a Yogi or Jnani(the wise) whose intellect is very subtle and as sharp as a sword. Such individual though regular practice becomes like a quite withered tree, an immovable object with a steady mind. He is in a state of conciousness, Alert and aware of all that is happening around him. His knowledge is refined to perfection. He remains unaffected by passion or sorrow. He is always calm and happy. None of us is like that and therefore only Iswara(almighty) is described as Sat-Chit-Ananda(True eternal bliss). Everything disintegrates on earth and this earth also will vanish one day. The sun will disappear and the whole universe will go. Then there must be some powerful substratum responsible for creation, protection and destruction. We call it God. We have the faculty of thinking and capacity of doing, in smaller or greater measure. This also merges, after our death, with the omnipotent. He is the supreme being, from whom we derive this energy. The stable principle which is the cause of creation and destruction of all energy is God, called by any name. I am prone to come to the conclusion that there lives none without predominantly selfish motives. But with years rolling on, an impression, that too a superficial one, true to my nature, is dawning upon me that there breathe on this globe some souls firmly rooted in morals and ethics who live exclusively for others, voluntarily forsaking not only their material gains and comforts but also their own Sadhana(spiritual penance) towards their(other's) spiritual improvement. It is clear to us that there is birth and there is death. Passion is the cause of birth. Time is the cause of death. What is created by passion is destroyed by time. If passion comes, the seed sprouts. If time comes, the tree dies. Kaalo Jagat Bhakshaka( Time destroys the world): Even the sun and the moon disintegrate when time comes. If there is no passion, there is no production. If there is no time then there is no destruction. Therefore we have to conquer Kaala(time) and Kaama(desire). Iswara(almighty) burnt Kaama(desires) and kicked time. So if we go to Him, there is neither birth nor death for us. Let us therefore pay to the Universal Father and Mother. O Father of the universe, lord of the supreme mother(the eternal energy) we bow to you. Why do we break coconut before Lord Ganesa's idol? He is the Son of Parameswara and asked His Father to sacrifice His head with three eyes because only then, he thought any effort would be crowned with success and without any obstacle. So, instead of the head with three eyes, we are breaking coconut which has three eyes. Ganesa is so powerful as to demand the head of his own father. Whatever is superior to everything else must be sacrificed to God. Symbolically, we are sacrificing the three - eyed coconuts created by God, as ordained by Him. When a Sannyasin(selfless seeker) attains Siddhi(spiritual achievement), this sacrifice of the coconut is performed. Joy comes in the form of status, money, etc. comes from without. We feel isolated. But it is the smallest fragment of the great joy from within, which is Ananda. Paramatman, the Ananda within, is not worried whether any joy comes from outside and mixes with it or not. Waters enter into the sea, which though ever being full, is ever calm/undisturbed. It is natural that man should seek to satisfy his wants like hunger, thirst, and a place to rest. There are duties which an individual has towards himself, the social group and the nation. Ordinarily, the performance of these duties remains on the level of satisfying the creaturely wants. But there is a way of performing these duties which will elevate everyone concerned spiritually. That is dharma(faith, belief, religion or duty). And it is the duty of the king or the state to see that the citizens are provided every opportunity for spiritual growth and progress. That is the meaning of saying: "Raja Dharmasya Kaaranam" (O King thus follow Dharma, the righteous path of spirituality).